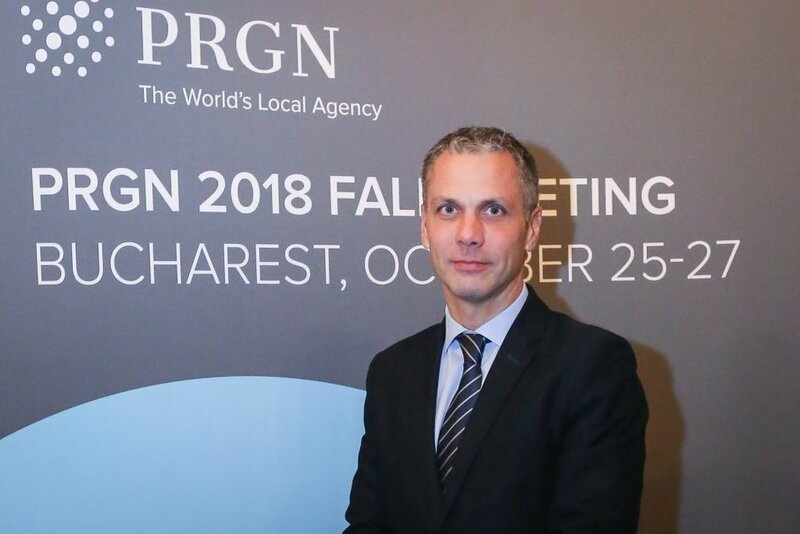 Bucharest, Romania – November 8, 2018 – The Public Relations Global Network (PRGN) announced the appointment of Gábor Jelinek as its inaugural Executive Director at its fall meeting held in Bucharest, Romania in late October, and recognized its member agencies with awards for the best communications campaigns in the past year. As PRGN’s new Executive Director, Jelinek will oversee all aspects of the organization, ensuring that strategic objectives are effectively met while developing new sales initiatives, enhancing partnerships and creating fresh marketing opportunities for PRGN’s participating firms, staff and clients. With nearly 15 years of agency management experience following a decade in journalism, Jelinek brings extensive knowledge in management and international relations, along with an in-depth understanding of communications disciplines and practices. Jelinek spent 10 years as a partner at Hungary-based, PRGN-affiliate partner, Goodwill Communications, where he managed the business communications portfolio of clients in multiple industries. Prior to joining Goodwill Communications, Jelinek served as Client Service Director at Weber Shandwick in Hungary, as well as Editor-in-Chief of The Budapest Business Journal. Also, at its fall meeting, PRGN recognized its member agencies’ best public relations campaigns that were carried out in the past 12 months. This year, a record number of 29-member agencies participated in the network’s annual International Best Practice Awards program, with 106 entries submitted, of which the best of the bests earned awards, as voted upon by agency leadership. Overall, the most recognized agencies in the 2018 contest were HWB Communications of South Africa and Landis Communications, Inc. (LCI) of San Francisco, California, which both received two golden, two silver and one bronze awards. They were followed by Spider PR of London, UK with two golden, one silver and two bronze awards. The highest number of golden awards were collected by L.C. Williams & Associates of Chicago, Illinois, which earned three golden awards in Bucharest as well as a bronze. Other agencies winning multiple awards were Free Communication of Bucharest, Romania; ADVERUM of Vilnius, Lithuania; Buchanan Public Relations of Philadelphia, Pennsylvania; The Conroy Martinez Group of Miami, Florida; The Fearey Group of Seattle, Washington; Goodwill Communications of Budapest, Hungary; Media Profile of Toronto, Canada; Multi Communications of Warsaw, Poland; Perspective Strategies of Kuala Lumpur, Malaysia; Sound Public Relations of Milan, Italy; Stevens Strategic Communications of Cleveland, Ohio; and Xenophon Strategies of Washington D.C. Founded in 1990 by a group of visionary public relations leaders, with more than $101 million in revenues and approximately 1,000 professionals in 50 locations, PRGN is one of the world’s largest international public relations networks. PRGN partners are independent, local, owner-operated public relations and marketing communications firms that share expertise and resources, while providing broad-based comprehensive communications strategies to clients worldwide. Companies or organizations interested in the services of PRGN’s local agency network can visit www.prgn.com for more information. Independent agencies interested in joining the network can visit the member recruitment section of the PRGN website for more information or email its membership chair, Lynn Erasmus, general manager, HWB Communications at info@hwb.co.za. Clients across six continents depend on the combined resources of the Public Relations Global Network (PRGN) to deliver targeted public relations campaigns in markets around the world. With revenues of more than $101 million (US), PRGN is one of the world’s largest international public relations networks. PRGN harnesses the resources of 50 independent public relations firms and more than 1,000 communications professionals to connect international companies and organizations with individual and culturally diverse markets globally. Visit PRGN online at www.prgn.com or on Twitter at @PRGN.